Baccarat Crystal is a manufacturer of fine crystal glassware located in Baccarat, France. The Musée Baccarat, on the Place des États-Unis in Paris, displays many of its finest productions. 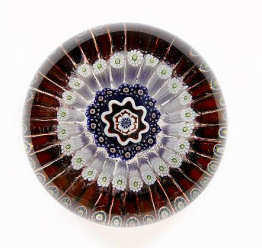 Pictured right: A very rare Baccarat concentric millefiori `fireworks’ paperweight circa 1848, it was made specifically to commemorate the French Revolution of 1848. This brilliant object is one of only two examples of this type known. Image Copyright: Bonhams. In 1764 King Louis XV of France gave permission to found a glassworks in the town of Baccarat in the Lorraine region in eastern France to Prince Bishop Cardinal Louis-Joseph de Laval-Montmorency (1761-1802). Production consisted of window panes, mirrors and stemware until 1816 when the first crystal oven went into operation. By that time over 3000 workers were employed at the site. Baccarat received its first royal commission in 1823. This began a lengthy line of commissions for royalty and heads of state throughout the world. In 1855 Baccarat won its first gold medal at the World’s Fair in Paris. Pictured left: A Baccarat spaced concentric millefiori weight and a Baccarat spray weight mid 19th century and 20th century, the second with stencilled mark. The first enclosing a central cane encircled with six others including three silhouettes of a goat, a cockerel and a dog, within an outer circlet of canes; the second with a spray of white lilies with orange stamens and green leaves on a white honeycomb-ground. Sold for £900, May 2006, Christies, London. Baccarat first began marking its work with a registered mark in 1860. The mark was a label affixed to the bot tom of the work. 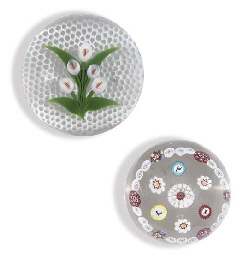 In the period 1846-1849 Baccarat signed some of their high quality glass paperweights with the letter B and the year date in a composite cane. A special paperweight dated 1853 was found under the cornerstone of a bomb damaged church in Baccarat when construction recommenced after World War 2. The crystal production expanded its scope throughout this period, and Baccarat built a worldwide reputation for making quality stemware, chandeliers, barware, and perfume bottles. The Imperial Era ended in 1867 with the defeat of Napoléon III. Influences outside of France began to have a stronger influence on Baccarat’s work during this era, particularly imports from Japan. Strong growth continued in Asia for Baccarat. One of the strongest production areas for Baccarat was perfume bottles, and by 1907 production was over 4000 bottles per day. 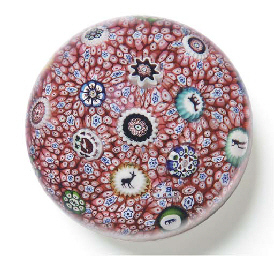 Pictured right: A Baccarat dated carpet ground weight signed and dated on a single cane ‘b1848′ The clear glass set with assorted scattered brightly coloured millefiori canes, including animal silhouettes of a stag, a peahen, a horse, an elephant, a butterfly, a cockerel, and a monkey, set on a ground of red and white canes, some with blue star centers. Sold for $13,145, October 2004, Christies, New York. In 1936 Baccarat began marking all of its works via acid or sandblasting. Baccarat created an American subsidiary in 1948 in New York City. By 2007 there were stores in Chicago; Costa Mesa; Dallas; Houston; Greenwich, Connecticut; Honolulu; New York; Troy, Michigan; San Francisco; Palm Desert, California; Las Vegas; and Atlantic City. A 12th location is set to open in Atlanta in 2010. A retrospective was held in 1964 at the Louvre Museum to celebrate the 200th anniversary of the crystal works. In 1993 Baccarat began making jewelry and in 1997 the company expanded into perfume.